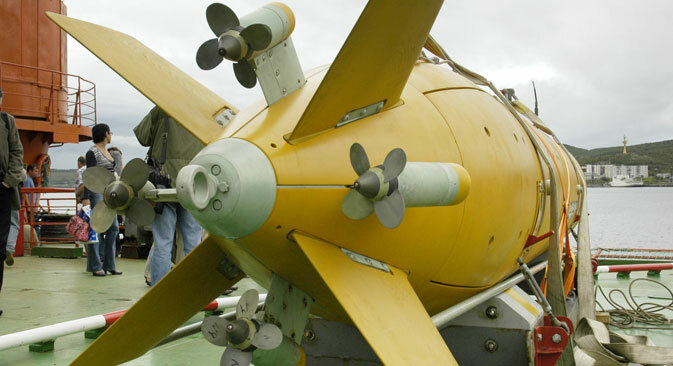 By 2017 Russian technology producers are planning to create Russia's first cluster for designing underwater robots for civilian and military use. Developers of underwater robots in Russia’s Far East want to unite into one professional cluster. They plan to create new robots that would be able to spend months underwater carrying out challenging missions and even replacing divers. They could be used for both military and civilian objectives, including shelf and geological exploration. According to developers, underwater robots may be available in the Asia-Pacific market in the near future. The most promising foreign partners in the creation of robotic systems are India, China, South Korea, as well as a few potential collaborators in Southeast Asia. The initiator of the Primorsky Cluster was the Concern Morinformsystem-Agat JSC. The company has been developing automatic managing systems for the Russian fleet for over 60 years. Within the framework of the cluster the developers also plan on creating a system that will help to control robots from a great distance. "The marine robotic system will be constructed in modules, which will make it universal," said Maria Vorobieva, Morinforsystem-Agat's press secretary. The developers hope that the cluster will assist in the defense capability of Russia's Pacific Region. "With the help of our partners we plan on creating a comprehensive solution, one that will be used for defending Russia's borders and economic interests, as well as for civilian use," added Vorobieva. Twenty Russian enterprises are planned for the cluster, including the Tetis group, Okeanpribor and Gidropribor Underwater Armament. In total the association will be supported by more than 100 industrial and scientific organizations. Several specialized scientific-research institutes and production enterprises already operate in the Far East. For example, the Institute of Marine Technology produces apparatuses that are used in the North Sea, Black Sea and the Pacific Ocean fleets. This institute created the Klavesin-1R robot, which is capable of submerging to a depth of 6,000 meters. It proved its usefulness on the Arctic seabed, where no other robots or technologies can function due to the low temperatures. Klavesin-1R helped scientists gather proof that the Lomonosov Ridge in the Arctic Ocean is a continuation of Russian territory. Currently, the robot is being used by the Russian Ministry of Defence. One of the world's most experienced underwater robotic technology teams works at the Far Eastern Federal University. With the cluster's help the university hopes to create underwater autonomous and remote-controlled robots that will extract oil and monitor the ecological situation and security matters. "Thanks to robots the time that people spend underwater can be reduced tenfold," says Alexey Tskhe, vice-president for Research and Innovation at the Far Eastern Federal University. "The entire world is trying to solve this problem, including our partners in Korea, China, the U.S. and Singapore. Sure, the autonomous underwater apparatuses developed at the university cannot do all the work that man does in the great depths. But some operations, such as visual inspection and diagnostics, our robots can do faster than man." Despite the great potential of these Russian scientists and the robots’ developers, their innovations are not breaking into the market quickly enough. Problems exist related to the marketing and commercialization of the already completed models. The initiators of the Far East cluster hope to solve this problem. "In order for these underwater robots to catch on first of all a strong industrial partner will be needed, one that would help bring the idea to the level of an authoritative model with large industrial potential," says Tskhe. "We have high expectations for the cluster because its aims are the commercialization and promotion of Russian developments."